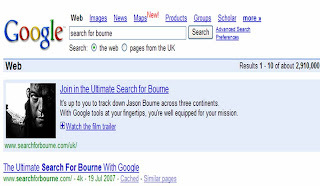 Search for Bourne - new Bourne film ties up with Google! 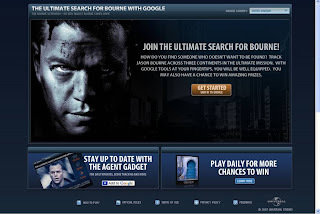 Another example of a clever campaign to promote a new film, but this time promotion for the new Bourne film is a great example of how Search can be used creatively / used for brand activity. It started on Monday 16th July and is running for one week. The campaign is a tie up between Universal pictures and Google. The consensus is that no money has changed hands as this is a mutually beneficial tie up. The activity obviously creates hype around the film and Google get to showcase a range of their products - notably iGoogle, maps and image search. 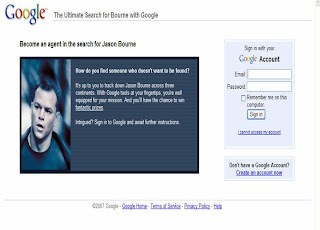 When you type 'Search for Bourne' into Google you see an image ad (above) that offers you the chance to 'join the Search for Bourne'. It also gives you the chance to watch the trailer. If you are willing to join in the search then you have to login to your Google account and you are then able to participate. 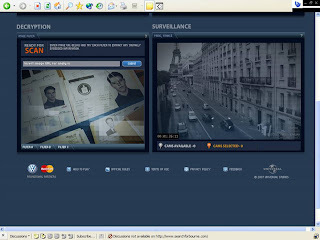 I got a bit confused about what to do, but you go through to a panel that has video and maps and allows you to look at different things to help you in your search for Bourne. This is a clever way of showing off Google products and a clever way of promoting a film. Whilst most of the online blog / forum discussions seem to be centred around the view that there are too many registration screens and the search / competition mechanic is too complicated, it has clearly fulfilled it's primary objective of raising awareness.